If you’re new to Crazy Eights, it is a similar game to UNO, except it’s played with a standard deck of playing cards. Many other games such as Swedish Gin Rummy and Spoons have originated from Crazy Eights as well. It’s unclear where or how the game itself was developed, but it has been around since at least the 1940s. The aim of the game is to be the first player to successfully discard all cards onto the playing pile, of course abiding by all the rules of Crazy Eights in the process. Whoever wins the round in Crazy Eights collects points from the cards left in the other players’ hands when they finish. The player with the most points at the end of the round wins. 1. Deal eight cards to each player. Place what remains of the deck of cards face down in the centre of play and turn over one card so it’s facing up. The upwards card will begin the discard pile. 3. If a player can’t match the card at the top of the discard pile on their turn, they must pick up a card from the turned over stack of cards until they can discard a card of theirs (if the face-down stack runs out of cards, a player who can’t put down a card simply passes their turn). 4. If a player chooses to discard and Eight at any time, they must also choose a new suit the next player must follow. If the following player can’t put down the chosen suit, he/she must pick up from the stack of cards. 5. Note: If you are playing with Jokers: the Joker acts as a blank card and the next player to have his or her turn can play any card on top of the Joker. 6.Once a player has successfully unloaded all cards, it’s time to total up the cards in the other players’ hands. The winner accrues all other player point. 7. The first player to get a set number of points wins the entire game. You can decide to play up to any number of points, but a good guideline is 50 points for every player in the game. For example, if two people are playing, it’s the first player to 100 points, if there are three people playing it’s the first to 150 points, for four players it’s the first to 200 points, etcetera. Crazy Eights is a great game to play in real life as all you need is some other players and a deck of cards. 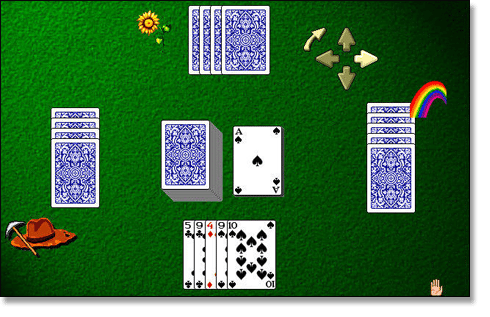 However, if you prefer to play it online there are several sites where you can play Crazy Eights for free. Texas Hold’em Poker: this is a casino card game that, like Crazy Eights combines luck and skill. If you prefer playing online for real cash it’s also a lot easier to find somewhere to play Texas Hold ‘Em than it is for Crazy Eights. Check out the Texas Hold’em poker games at leading card game sites like G’day Casino and All Slots. Blackjack: Again blackjack is another card game that combines skill and luck. There are a whole heap of blackjack variants, so we suggest trying out a few different types to see which kind you like best. Blackjack can be played at all the leading online casino sites. Try our favourite Jackpot City Casino. Odd One In: Odd One In is more luck-based than Crazy Eights, but it’s similar in that it’s a creative game that revolves around a standard deck of playing cards. To play you place your chips on a table of betting options similar to how you would in a game of roulette, for example you can bet that the cards drawn will add up to the number 9 or that both cards will be diamonds. When you’re ready two cards will be drawn. Any bets you win will automatically be handed over. All information detailed above is intended for international audiences only. Australians cannot legally play online card games as of September, 2017.